Overtime games are becoming a normal thing during this MLL season and the weekend of June 24 was no exception as a team not named the Denver Outlaws is in first place. Denver dropped half a game behind first place Ohio while Florida fell two games behind. Charlotte moved to .500 on the season and into fourth place while Rochester finds itself three games out of first place. Atlanta, Chesapeake and New York all find themselves at 3-5 and a game out of playoff contention. Boston at 3-6 needs to win out the rest of the season to have any chance of making it to the playoffs. Teams will be looking to shake up their rosters and add depth as the trade deadline looms and they make their bids for the championship. The Ohio Machine faced a true test of three games in eight days and won on both Thursday and Saturday, moving them into sole possession of first place. Boston scored first, but Ohio reeled off four straight goals, followed by Boston going on a three-goal run. Ohio finished with a 6-5 lead at the end of the first. In a game of runs, Boston dominated the beginning and end of the second quarter to take a 10-9 halftime lead. The fireworks calmed down in the third quarter and Boston only scored three times to Ohio’s two scores and gave the Cannons a 13-11 lead going into the fourth. Marcus Holman and Tom Schreiber both scored at the end of a back and forth final period to send the game into overtime. Holman scored the OT winner from Peter Baum 6:26 into the extra frame. Holman led the Machine in scoring with five goals and won offensive player of the week honours. Connor Cannizzaro and Baum scored hat tricks for Ohio. Davey Emala and Kylor Bellistri each scored four goals for the Cannons and Kyle Jackson added two goals to lead Boston. Joe Nardella took the majority of the face-offs for Boston but the Cannons took a 25-35 advantage in that area. Both goalies, Kyle Bernlohr and Tyler Fiorito, made 15 saves. Next: Ohio faces a New York squad hell-bent on ending Ohio’s win streak. Boston is off until July 16 when they take on Rochester and try to run the table and make the playoffs. Denver came from behind to defeat the New York Lizards in a spectacular finish. The win has them half a game behind Ohio, holding a game in hand on the Machine. The Lizards got out to a fast start with 4-2 first quarter lead and then exploded for seven goals in the second, leading 9-2 at one point before an 11-6 score at half. However, the Lizards’ offense died with a two-goal third quarter, allowing Denver to climb back in the game with five goals, narrowing the Lizards’ lead to 13-11. Matt Kavanagh provided a natural hat-trick to end the third. The New York offense remained dormant as the Outlaws outscored their opponents 6-1 in the final quarter to secure the win. 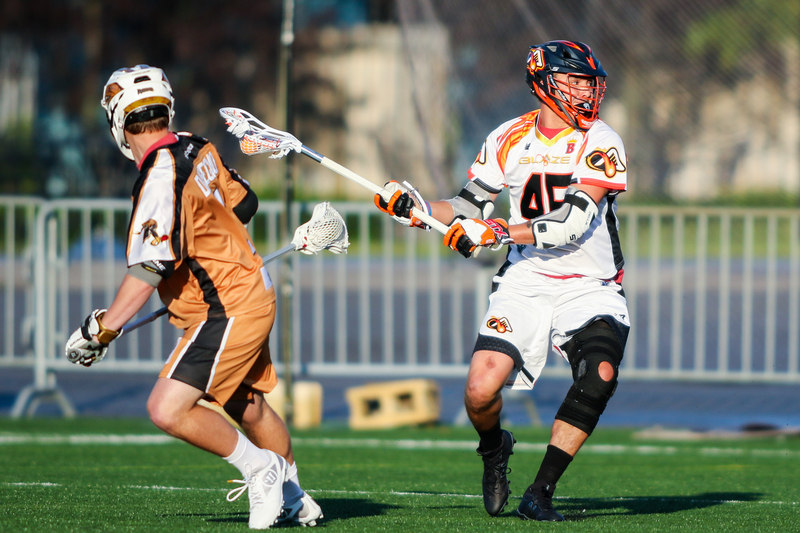 Jeremy Sieverts and Kavanagh each scored four goals to lead Denver in scoring while Gavin McBride, in his debut, and Wes Berg each scored three goals. Curtis Dickson led the Lizards with five goals including a highlight-reel stretch goal from behind the net while Rob Pannell and Paul Rabil scored hat tricks. Greg Gurenlian went a typical 21-35 at the X. Drew Adams made 18 saves, but still took the loss as Jack Kelly made 12 saves. Next: Denver faces an Atlanta Blaze team that earned a big win and looks to keep up the momentum while New York looks to rage against the Machine and knock Ohio out of the top spot. Ohio continued its winning streak and defeated Chesapeake to take a half-game lead over Denver and move into sole possession of first place. The Bayhawks tried to take advantage and jump on a Machine squad that played earlier in the week, but could only manage a 3-3 tie in the first quarter in Lyle Thompson’s season debut. Ohio performed like its namesake and churned out four goals and took a 7-5 lead at the half, then leading 11-7 at the end of the third. The Bayhawks’ offense came to life in the third quarter with six goals, but it proved too little too late, as they failed to overcome Ohio’s lead as the Machine won 15-13. Connor Cannizzaro led Ohio with four goals while Marcus Holman and Peter Baum scored each scored hat tricks. Josh Byrne and Jake Froccaro each scored hat tricks while Miles Jones and Lyle Thompson each potted two goals for Chesapeake. Face-offs proved almost even as Ohio had Kevin Reisman (15/31) face Ben Williams (16/31) most of the night. Nikko Amato made 15 saves. Kyle Bernlohr made 11 saves. Next: Ohio looks for a remake of Fury Road to keep the Lizards out of playoff contention while Chesapeake looks to close ground on the Rattlers as Lyle Thompson joins the Bayhawks for the rest of the MLL season. The Charlotte Hounds grounded the Launch as they ended Florida’s win streak and moved to .500 on the season. The Hounds got off to a promising start as they opened up with a 2-point goal by Michael Ehrhardt, but then Florida ripped off five goals in a row. Florida rode a 5-2 lead into the second quarter but Charlotte outscored the Launch 10-4 and took a 12-9 lead at halftime. The scoring cooled considerably in the third quarter as the Hounds scored twice to the Launch’s single tally. The Launch made a three goal run at the end of the game, but Florida could not overcome the Hounds lead as both teams scored four goals in the fourth. John Haus led Charlotte with five goals followed by Kevin Crowley with four. Kieran McArdle led Florida with four goals as Dylan Molloy and Chazz Woodson each added three. Charlie Cipriano got the win as he made 17 saves for the Hounds while Austin Kaut made 14 saves. Will Gural won the face-off battle for the Launch going 18-32 at the X. Next: Florida takes on an Atlanta squad looking to extend its winning streak while Charlotte hosts New York in a battle of teams looking to keep the other out of the playoffs. In the second overtime game of the weekend, Atlanta defeated the Rochester Rattlers and moved to 3-5 on the season and into a tie with New York and Chesapeake. The Blaze came out on fire and took a 4-2 lead in the first quarter, but the Rattlers narrowed their lead to 6-5 at halftime. Atlanta extended their lead to 10-7 at the end of the third. Rochester looked poised to come back and win the game as they scored six goals to Atlanta’s three, but they could only force overtime. Randy Staats scored the game winner for Atlanta in overtime. Staats and Jeremy Noble led the Blaze in scoring with four and three goals. Zed Williams led Rochester with three goals while John Ranagan, Jordan Wolf and Ryan McNamara scored two goals apiece. Adam Ghitelman made 15 saves and John Galloway stopped 11 shots while Scott Ratliff, a kid from Atlanta, won defensive player of the week honours. Next: Atlanta takes on a Florida team looking to win and make it to the playoffs while Rochester travels to Chesapeake and keep the Bayhawks behind them in the standings.